It’s been ages since I’ve updated the blog, and truth be told, I haven’t had any real news to share, owing to the fact that my lovely, shiny new horse Fred broke his pelvis about a month after he arrived. Thankfully, the fracture was not displaced, and Fred was able to bear weight comfortably while he healed. However, The healing process took four months, and we just got the green light to go back to work a couple weeks ago. All was not immediately rosy, however, because if you recall for the last couple installments here on the blog, I was struggling with saddle fit issues. Once more into the crucible, I thought. 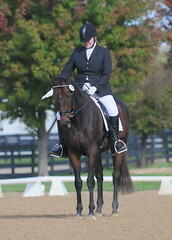 A friend loaned me her Bates Extra Wide dressage saddle, and while it was an improvement, it wasn’t perfect. On a whim, I swung by my my local tack shop to eyeball consignment saddles there. I have a pretty strong preference for buying used saddles, because I’ve determined that I simply can’t make a decision on a saddle with just one light gentle ride, and let’s face it – most places won’t let you **really** ride in one of their bnew saddles. In order to assess fit and balance, I prefer to ride in a saddle for several days in the row, to ensure both the horse and I are comfortable, balanced and happy. Lo and behold, I was in luck, for there on the rack was a Schleese JES, with the size seat and tree I was looking for. I scooped it up, swiped my credit card, and headed straight for the barn. Upon arrival, I gave Fred quick, cursory brushing and then plonked the saddle straight onto his back. It appeared to be balanced, and best of all, it seemed to fit very nicely on the sides of his withers, with the panels sitting flush against his body. I tacked him up, adding a fleece pad for a little extra cushion, because the flocking is kind of hard, and off we went. Fred signaled his approval immediately, stretching into good contact, something that had been evading me with less comfortable saddles. Now, in addition to being as squishy and out of shape as my mount, I’m also recovering from a two week long bout of bronchitis. We didn’t put it a ton of work, but I was satisfied that the saddle was reasonably comfortable for Fred. I texted Christy with the message: Put me on your schedule for tomorrow! I did short lesson with her tonight, and she said that we were ahead of where we left off, despite our downtime, something which we both attributed to improved saddle fit. I’m calling the fitter tomorrow, to see about scheduling an appointment for her to come out to evaluate and flock the saddle. In the meantime, I’ll put a few more rides into it and be sure that both Fred and I are in agreement. It would be wonderful if we could put the saddle hunt behid us and move on with our lives! In the meantime though, I’m thrilled that Fredders is feeling good, and that we’re starting to get back to work.